My rating: An extraordinary read, very convincing, with an ending that is both satisfying and disturbing. I won this book, probably on Twitter, and promptly added it to my huge TBR (to be read) pile. Had I known what I was in for I would not have waited so long to read Secret Daughter. Oh my! Canadian first-time author Shilpi Somaya Gowda has written a compelling story that had me from the beginning. Born in Toronto, Canada, to parents from Bombay, India, she had insight and good understanding of both cultures. She mostly told the story from the perspective of three women – the adopted daughter, the adoptive mother and the birth mother. It was involved and interesting and hard to put down once I started reading. I don’t want to give away too much and spoil it for you, but for anyone who has adopted from another country, or is thinking about it, this book gives a different view of some of the things to take into consideration. The characters are well-developed, their life situations are convincing and detailed, and the reader gets to share in the story of their lives over a span of twenty-five years. It was easy to care about them. In fact, I experienced a range of emotions as I read this international bestseller. I liked how the author headed her chapters with not only the title, but also the location, date, and name of the person the reader was visiting in that chapter. Each chapter is only a few pages long which made it easy to read when having only a few minutes. It also helped the reader get oriented right from the start and occasionally helped the author step over a span of several years to move along in the story. It was well done. The only thing I did not like is the way the author chose to end this novel, although it is quite believable the way it happened. Obviously the ending did not interfere with the book’s success. Even so, if you are one who likes to read the end of a book first … in this case DON’T! Please, do yourself the favour of not peeking. It is well worth the wait. There has been criticism that the author ignored or changed some things about the culture of India to fit her story, but I don’t agree. In a couple of places I had questions, too, but since I have never studied their culture nor have I visited that country, I accepted that perhaps it was something that is changing there with the times. I believed the author would know that, so I didn’t let my lack of information get in the way of a great read. Originally, this is not a book I planned to review, but having experienced it I wanted to introduce it to you to add to your TBR list. You won’t be disappointed. You can find Secret Daughter listed on my BUY THE BOOK! page. 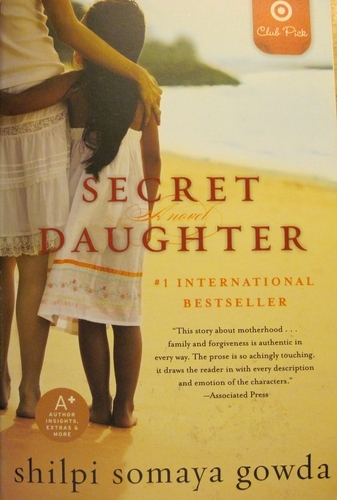 This entry was posted in Mostly About Reading, Reviews & Interviews and tagged adoption, India, international adoption, international bestseller, mother-daughter relationship, orphanage, Secret Daughter, Shilpi Somaya Gowda, women's fiction. Bookmark the permalink. I read this book around the same time I read CUTTING FOR STONE (I think that’s the title), a comparable book which got a lot less attention, but, in my opinion, is so much better. It’s long and complicated, but very authentic, and I was completely absorbed in a world about which I knew next to nothing. If you haven’t read it, maybe you’ll get a chance! This is a book on my TBR list. Thanks for the great review. Now I am even more eager to read it. I’m glad, Darlene. I am sure you will enjoy it. Your note about the structure of the book was interesting. I often carry a book of essays or magazines with me, for those times when I have ten or fifteen minutes of reading. It sounds like this book would do rather well for “purse literature” too! Definitely! It’s chapters are bite-size and easily read because of that. It would be wonderful to see this as a kid’s book! Perhaps your mother would enjoy this one, though. Sounds like a good read. I’m trying to keep my head in the YA genre right now, but I will add this to my list for future reading. Thanks so much for the review, Lynn.